Hadith about Hypocrisy Read in English, Urdu and Arabic. Narrated Mahmud bin Labid (may Allah be pleased with him): Allah’s Messenger (PBUH) said: The most dreadful thing which I fear about you is minor polytheism. The companions asked: What is minor polytheism? 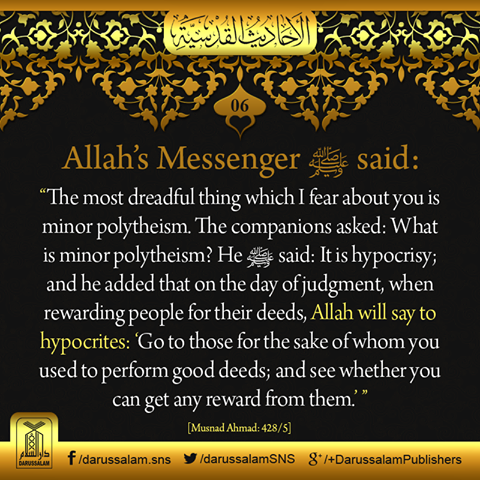 He (PBUH) said: It is hypocrisy; and he added that on the day of judgment, when rewarding people for their deeds, Allah will say to hypocrites: Go to those for the sake of whom you used to perform good deeds; and see whether you can get any reward from them.